CalArts student Hanna Kim wins gold medal for animation (domestic film schools) at the 45th annual Student Academy Awards. | Image: Richard Harbaugh / ©A.M.P.A.S. 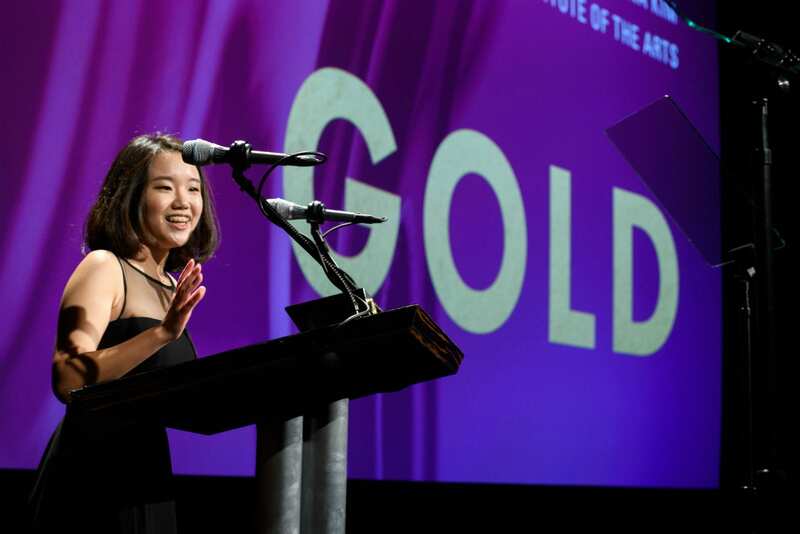 CalArts student Hanna Kim (Film/Video BFA 19) won the gold medal for Animation (Domestic Film Schools) during the Academy of Motion Picture Arts and Sciences’ 45th Student Academy Awards ceremony at the Samuel Goldwyn Theater in Beverly Hills Thursday night. Kim won for her animated short “The Raccoon and the Light,” which follows the nighttime adventures of a raccoon who discovers a flashlight in the woods. Her award medal was presented by actor and comedian Kumail Nanjiani (“The Big Sick”). The Academy honored 19 students from colleges and universities around the world during the ceremony. During her acceptance speech, Kim thanked her parents for their everlasting support, and singled out her mother’s penchant for giving her children’s books, which served as inspiration for the film. Taking silver and bronze in the animation (domestic) category were “Daisy” by Yu Yu from the University of Southern California and “Re-Gifted” by Eaza Shukla from Ringling College of Art and Design.